9to5Google reported that recent code commits and reviews from Google developers found in the documentation for Chromium OS may suggest the company is working to make dual-booting Windows 10 on the two-in-one device a possibility in the near future—though there is plenty of reason to be skeptical about it. Rumors of Google’s interest in expanding the functionality of the Pixelbook have been swirling for some time now. The idea of Windows 10 compatibility first popped up earlier this year, when keen-eyed observers first spotted mention of an “AltOS” in Google’s documentation. One of the commits made mention of a “picker screen” that would allow users to select which operating system they would like to boot from. Another directly named Windows, further fueling the speculation. While running Windows 10—and gaining access to all of its functionality and applications that ChromeOS lacks—is exciting, but it also still feels like a bit of a longshot. The CPU demands for Windows 10 is a lot higher than Chrome OS, and the Pixelbook’s low-power Core i5 Y series processor was chosen specifically for the ultra-lightweight operating system. A more resource-intensive OS like Windows 10, combined with the lack of fans in the Pixelbook, presents some challenges and potential for overheating. Even if making the Pixelbook Windows certified is feasible, it doesn’t make the two a good match. 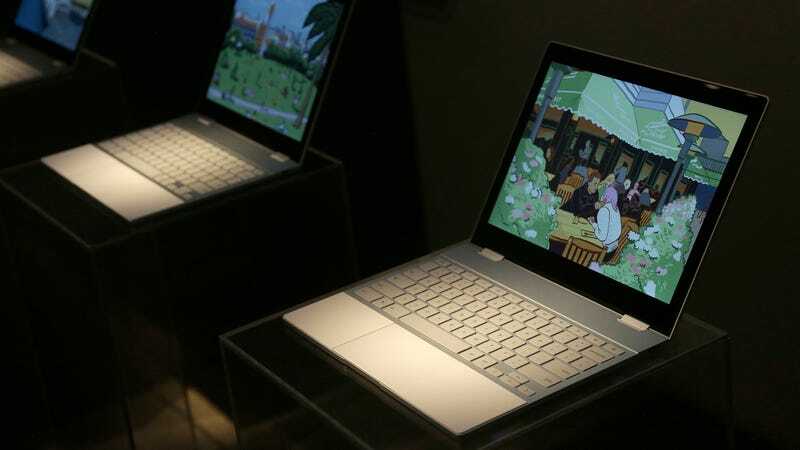 Gizmodo reached out to Google and Microsoft for more information on the possibility of Windows 10 running on Pixelbook. We will update this post if we hear back.